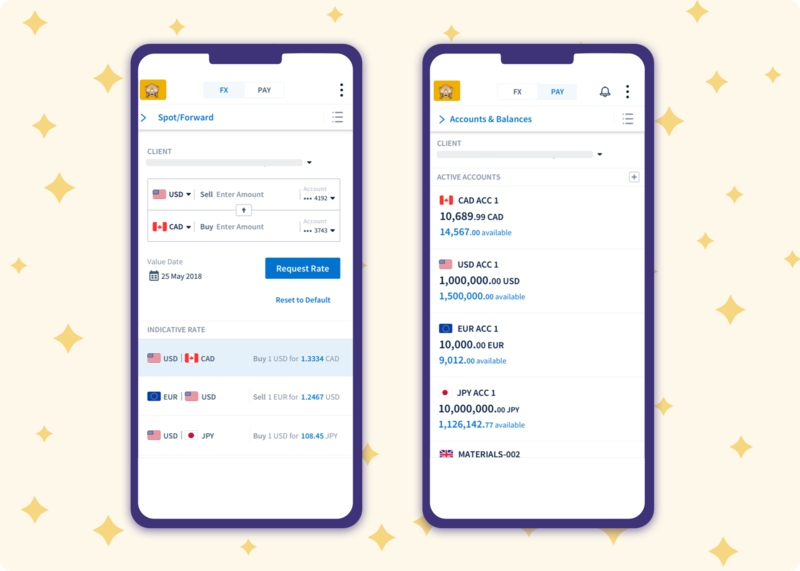 Initially intended as a stand-alone FX trading application, commissioned by a major Canadian banking institution (branding obscured), the scope of the project grew to incorporate the redesign and re-think of the institution’s foreign payments system. 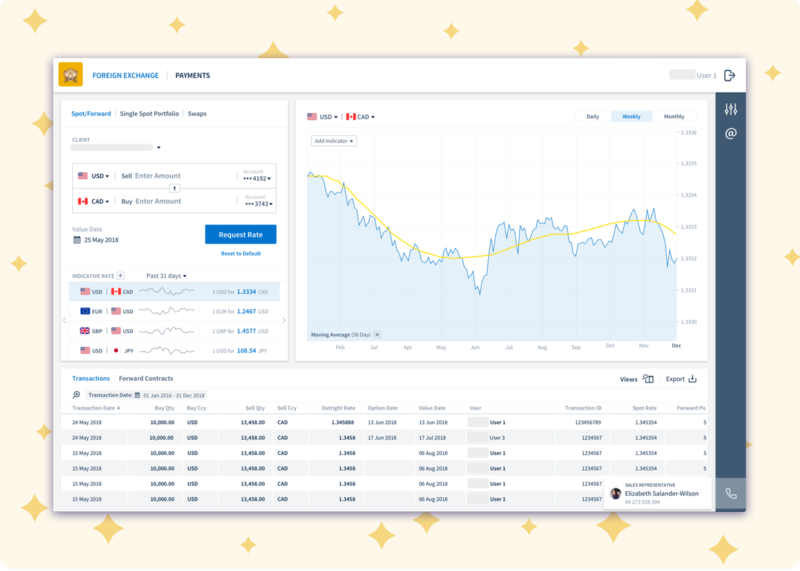 Requirements for the FX trading application where initially gathered through workshop and user interviews, working out the features and design approaches that would best benefit the institution’s core user base. 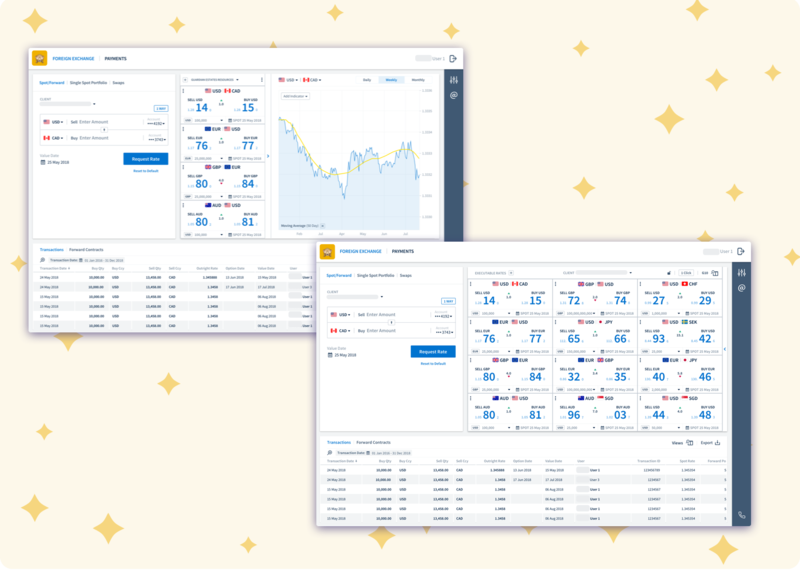 The previous version of their FX trading platform was a complex application, with a cumbersome layout system that was designed for detailed customisation, to the detriment of usability. It was found that over 80% of the users didn’t engage with the customisation tools, and relied on the their sales representatives to set up their dashboard for them – putting a burden on the institution’s internal teams. Furthermore, we discovered that most users weren’t technologically proficient and their workflows were actually quite simplistic, in comparison to the wealth of features provided by the old version. 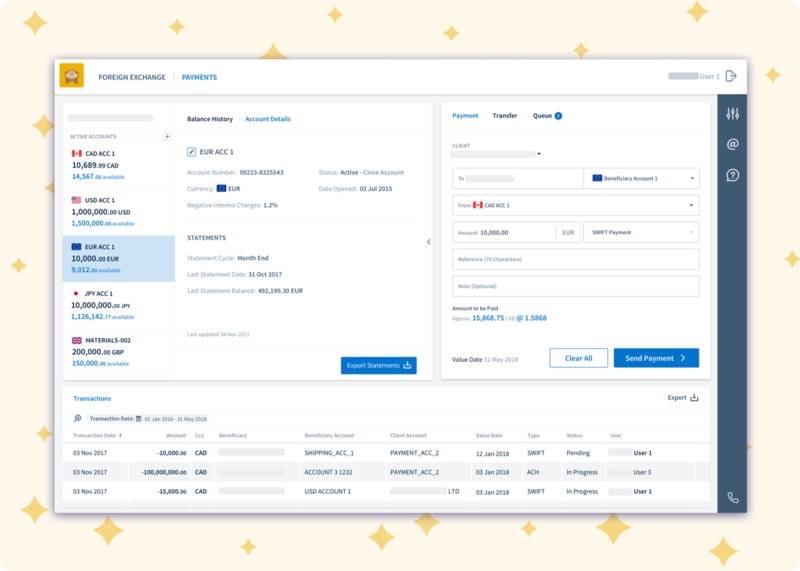 Our design priority became to provide the majority of users with a streamlined, easy to understand journey throughout the application, by surfacing their needs as a priority, but smartly incorporate the more complex elements, reserved for the more experienced but still relevant customer base, in a still accessible but not distracting manner. 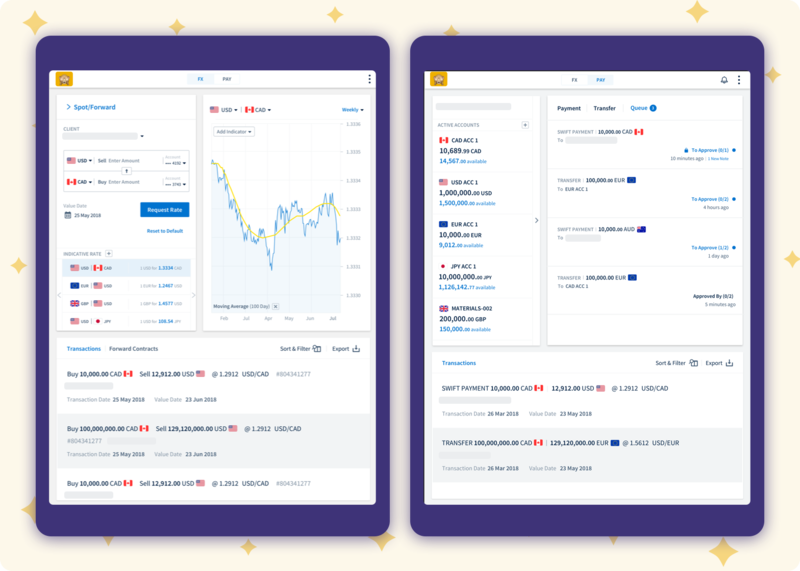 The project was developed with an Agile approach, starting with the most core user-flow of requesting an exchange quote, placing a trade and reviewing it on the blotter – and then further incremented with new functionality, such as different order types, visualizations, etc. Supported by workshops and client out-reach sessions with users, all features added throughout the year engagement went through a process of iteration, from paper sketches, to wireframes and polished visual designs (with some animated prototypes using Sketch). The Payments systems was a project that started halfway through the FX application. Originally placed as a whole separate entity, we helped the client understand the benefits of incorporating the payment system which uses foreign currency, with the platform used to trade those currencies. This UX engagement was led by myself, with another valuable UX team member. Both integrated applications were designed to be fully responsive, from wide desktops monitors to smaller mobile sizes.